Sir Richard Branson's Virgin Group and Northern Rock's own board have both made rescue offers for the bank. They are the only two parties to submit proposals to the Treasury after investment fund Olivant pulled out before the end of Monday's deadline. While Virgin will inject more cash into the bank - £1.25bn compared with £500m from the Rock board - the in-house offer has gained shareholder backing. The government needs to decide on the Rock's future by the end of this month. This is so it can then go the European Commission to get approval for any rescue deal by 17 March, the cut-off date for the current £55bn of financial assistance given to the Rock from the Bank of England. While the government remains committed to finding a private sector buyer, analysts said nationalisation of the Rock could remain a possibility if neither the Virgin or in-house offer is ultimately deemed acceptable. Under the terms of its rescue plan, Virgin will inject £1.25bn into Northern Rock and take a stake of 55% in the firm. The equity will be a mix of cash, and new shares, the group said. "We have made a proposal that seeks to stabilise the company and rebuild it as a trusted and thriving institution under the Virgin brand with a long-term future," said Brian Pitman, one of the main figures associated with Virgin's offer. He added that the plan would "see taxpayers interests protected and give existing shareholders the opportunity to invest alongside, and at the same subscription price, as the Virgin Consortium". 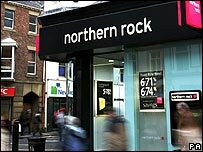 Northern Rock's managers said their proposal included raising at least £500m, reducing the assets on the bank's balance sheet, and reorganising its operations. Is nationalisation still on the cards? While it is offering to inject significantly less new funds than proposed by Virgin, the in-house bid has already secured the backing of Northern Rock's second largest shareholder - RAB Capital. A spokesman for RAB Capital said the offer from Northern Rock's management was the "only one strong and independent solution". The BBC understands that the Olivant investment fund pulled out of a rescue because the government wanted its £25bn of direct loans to Northern Rock repaid within three years. Olivant was planning on repaying those government-backed bonds over five years, and was only told about the three year time limit late on Friday. The investment fund said only that because it had not been able to come up with a deal that met its "investment criteria". The BBC's business editor Robert Peston said that Olivant withdrawing its proposal was "very bad news for Northern Rock and very bad news for the Treasury". "The prospects of getting an acceptable deal for taxpayers would have been much higher if they'd had something of a competition," he said. Northern Rock got itself into financial difficulties because its business model left it ill-prepared for the global credit crunch. Unlike the great majority of UK banks, Northern Rock relied heavily upon borrowing funds from the wholesale money markets to fund its mortgage business, rather than the usual method of mostly using savers' deposits. When the credit crunch hit, Northern Rock suddenly found it could not secure the cheap funds it needed, as credit was either unavailable or markedly more expensive. A recent report into the collapse of Northern Rock by the House of Commons Treasury Committee was highly critical of the UK financial watchdog, the FSA. While the report said Northern Rock's senior managers had been most at fault, it said the FSA had been guilty of a "systematic failure of duty" in not preventing the bank's "reckless" business plan.